Available Again! This course was run previously so if you didn’t have time to finish or didn’t get a chance to take the course previously, here is your chance! Enroll today! Apply more advanced JET functionality, including navigation, routing, validation, layouts, and responsive design. 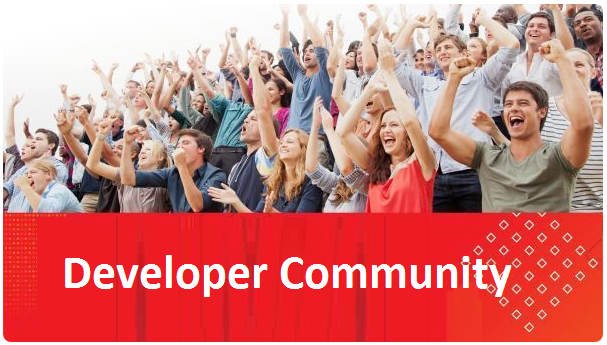 Create hybrid mobile applications with Cordova in combination with Oracle JET. Integrate with the world outside Oracle JET, e.g., the Composite Component Architecture (CCA components) and the Oracle Cloud. Deal with the remaining enterprise-level challenges, i.e., internationalization, accessibility, and security. 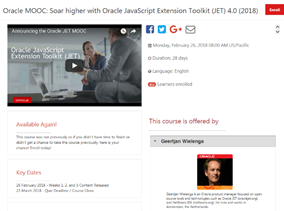 Geertjan Wielenga is an Oracle product manager focused on open source tools and technologies such as Oracle JET (oraclejet.org) and NetBeans IDE (netbeans.org). He lives and works in Amsterdam, the Netherlands. For more details please visit the registration page here.